Saltbox style house where Maggie and Tim resided. Photo courtesy of their granddaughter Margaret Whalen. The architectural style of the house in which Aunt Maggie and Uncle Tim lived beside the road in St. Jacques is known as first generation salt box; a single story with a loft formed by a steep-sloped, shingled, peaked roof. When it was built no one really knows; however the style was common after 1835 and went through several adaptations over time. In its latter years it stood out among all of the other houses because of this style. By the mid-to-late twentieth century it was the only one left in the community; though they had been quite common throughout the nineteenth century. Aunt Maggie raised her first family there with her husband John Power. 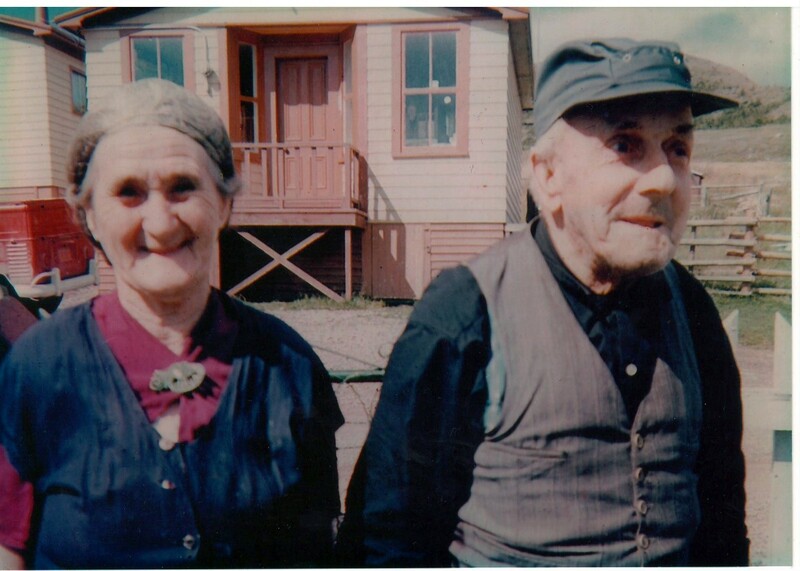 Some say John came from St. Pierre and Miquelon; others say he came from somewhere in Placentia Bay. Both scenarios may be right. Born in 1860, he probably moved around a bit before settling in St. Jacques. 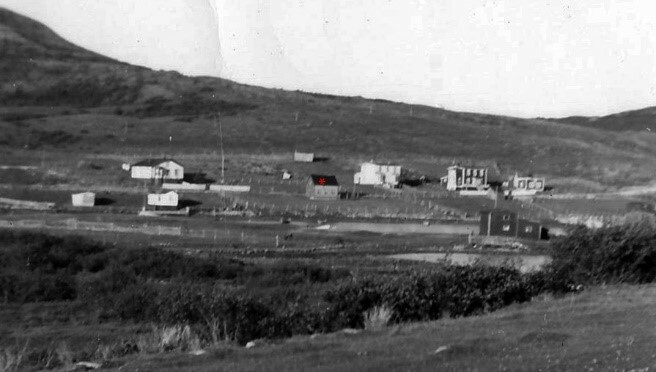 His young wife Margaret Barnes was born in Big St. Joseph’s, Placentia Bay in 1890. They had six children: Lawrence (1909), Mary Ann (1911), John (1916), Ignatius (1917), Bridget (1919) and Lillian (1924). John died around 1925. Maggie remarried in 1927 to Timothy Whalen, a man born in St. Jacques in 1891 to James and Sarah Whalen. They had one child, a son Joseph (1928). In true affection and respect, voluntarily offered, they were given the title of aunt and uncle to all who lived in the community and by many from surrounding towns such as English Hr. West, Mose Ambrose, and Belleoram. Rarely does a couple achieve the recognition as to be mentioned in the same breath as that achieved by Aunt Maggie and Uncle Tim. Throughout their lifetime the door to their house was open to all who wished to enter and during their forty-two years together few, if any of the generations who shared that time, missed the opportunity to sit and talk with the couple in their compact kitchen. Maggie, according to all who remember her, was a delightfully gregarious woman who enjoyed the rhythm of music which she expressed through her love for dancing. She was frequently the first person to choose a partner and move onto the dance floor at a ‘time’ in the Parish Hall, or in a neighbour’s kitchen. 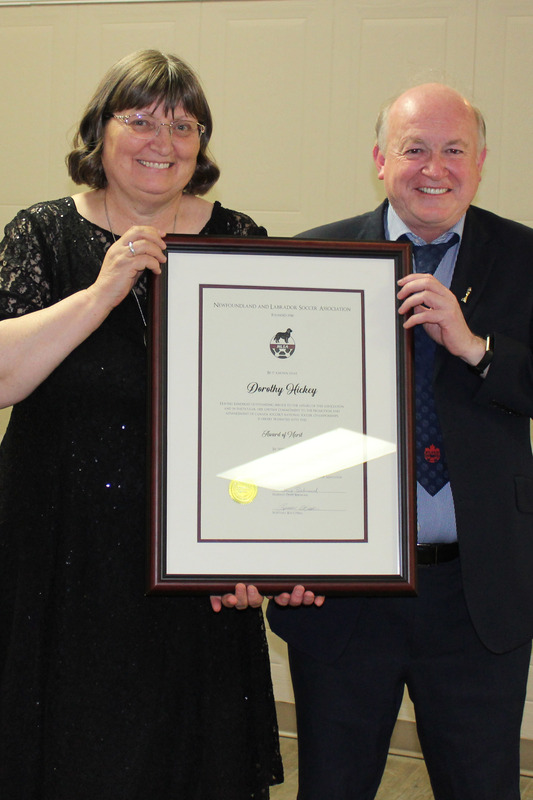 She especially enjoyed teaching young people the moves and progressions of square dances and could be seen with her choice of dancers on her arm throughout an evening. While the music played Aunt Maggie danced. When there was no musician to play the fiddle she improvised by playing the ‘comb’. This is an old world method of making music by placing a fold of water resistant paper over an ordinary hair comb and humming a tune thereby causing vibration against it with ones lips to create a sound similar to that created by a kazoo, which is readily recognizable today. It is affectionately told that when Robert and Mary Oakey married in the early 1940’s Aunt Maggie could be heard in the kitchen creating dance music well into the evening on her comb for which there was no shortage of dancers. Tim was known for many things, all complimentary. Among them was his incredible strength and another his spatial knowledge, both of which has left him legendary in memories and stories. Though his stature was not out of the ordinary he possessed strength in his arms, legs and back that placed him above his peers in the physical feats he could accomplish. Stories are told of seeing him lift a forty-five gallon drum of gasoline and moving boulders other men had failed to budge. One story which has been told with variations had him carrying a ten stone sack of flour from English Hr. West to St. Jacques on his shoulders without once stopping for a break – a distance of ten kilometers! This came about when Harry Petite, at whose store the flour was purchased, asked him how he was planning to get the sack of flour home. Tim replied, “I’ll carry on my back and do it without taking a spell, sir.” Petite, doubting it could be done, paid a young fellow $2.00 to follow Tim to St. Jacques to see if indeed he could do it without taking a break. The young man reportedly informed Mr. Petite that Tim did as he claimed he would! Uncle Tim had a reputation for his ability to look at a pile of rocks, envisage a stone wall and without hesitation set about building the wall. He would sort the stones by size and shape then craft a stone structure which would last beyond his lifetime. This skill he used to the satisfaction of many customers who hired him to build retaining walls in the community. Today one can still see some of his handiwork in old stone drains which pass under local almost forgotten roads as well as rock walls which protected houses from foundering hillsides. Blindness did not prevent Uncle Tim sawing from his own wood. Using his well-developed spatial sense he was able to measure with his hands the distance to move the stick of wood along at just the right interval to saw off a junk the perfect size for his stove. Across the road, Uncle Tim’s sawhorse was a permanent fixture, always in the same place. Aunt Maggie would lead him across the road, assist with placing a stick of wood on the sawhorse. She’d return to her house and when another was needed he’d call her name. The low ceiling of their cozy house meant there was little room for heat to escape thus every visitor that was met with a warm heart was also met with a warm room within to sit. Aunt Maggie and Uncle Tim lived simple and frugal lives yet they were exuberant in attempting to share with you whatever food they had available at any meal. Many residents recall not only the delectable, mouth-watering aroma of home-made bread emanating from her kitchen but also the texture and taste of it fresh from the oven, still hot on the inside with a crunchy crust on the outside. Biting into a slice of her bread with melted butter or molasses was an experience comparable to dining at the hands of the world’s greatest chefs. Little did most of us know it at the time! Uncle Tim never lost interest in knowing who had entered the house. He could be frequently found lying back on his daybed beside the window which looked over the Barachoix. As soon as he sensed you were seated he would ask Aunt Maggie who was visiting and once he knew your name and the names of your parents all was well with his world and yours. After Tim died in 1969 Maggie moved away from St. Jacques into a senior’s home in Holyrood where she spent the rest of her days regaling and entertaining her fellow housemates with wondrous stories of her life in St. Jacques. She died in 1990 in her one hundredth year. Though their first generation salt box house is gone from its foundation and the space it occupied now incorporated into the road which for decades detoured around it, those of us who sat in the kitchen of Aunt Maggie and Uncle Tim can still imagine them standing in their yard, smiling at passerby’s or walking arm-in-arm over the Barachoix Point. Sometimes when the wind catches in a twig on a tree and vibrates, I hear Maggie’s comb and see her lined face looking back at me. When I walk by any of the rock walls found throughout St. Jacques the strong hands of Uncle Tim carefully placing each stone are still at work, selecting, positioning and testing its stability. It takes little effort to pause in awe and stand for a moment in his shoes as he assessed his own handiwork. Photo by John Burke – early 1970’s. Provided by their granddaughter Margaret Whalen. Enjoyed this story very much! Do you know the name of the Catholic Church you referred to in the story where the Whalens went? The Roman Catholic Church, located on the eastern side of the harbour, was named Sacred Heart. It was built in the early 1890’s and remained in active use until the 1970’s. Love it! I grew up in that dark green house and have fond memories of the “Barrisway” and Aunt Maggie and uncle Tim. Wow! Fantastic! Love the Aunt Maggie and Uncle Tim story. They were my grand parents. My Dad was their son Joseph. He passed away in 1970 so I never knew anything about his family. I never met them and was so happy to learn a bit about them. Sure did enjoy this and learned a bit about them.